“Th’anam an Dhia but there it is the dawn on the hills of Ireland”. The poet’s words come echoing down the years as the Boston plane approaches the Irish coast on a beautiful May morning 1991, almost fifty six years since this passenger had left those hallowed shores. In August 1935, I left Galway by Cunard Liner to join my father in Boston, where I was born some fourteen years earlier. I had spent the last twelve happy years at my grandparent’s home in Tullavrick, a little village just outside Oughterard, since arriving in 1923 due to my mother’s death. As the plane touched down on Irish ground in Shannon, the memory of that early time wiped out all the exile years. I was accompanied on this trip home by my wife Margaret of some forty-five years and my youngest son Michael, and his wife Sue. They had persuaded me to go to Dublin first which was a good decision, for the four days in Dublin enabled me to quell the emotional turmoil caused by my return. Despite all that occurred during the intervening years – high school, college, World War 11 service in Europe, a professional career in accounting and a happy married life – I was still overcome with emotion when I reached the Square in Oughterard. It was there I thanked god for giving me the chance to come home again. 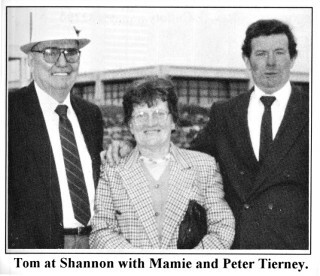 The rest of the homecoming now rolls before my eyes in loving retrospect – the visit to my uncle Tom and his family in Tonwee: the meeting with Pete Tierney, my Aunt Margaret’s son who was born years after I left Ireland. My beloved Aunt Margaret who passed away in 1952 who gave the love and care unequalled by any mother. Then the visit to the cemetery where my grandfather Michael and Grandmother Julia and Uncle Bartley together with my aunt Margaret are laid to rest. All who were around Uncle Tom and I in those happy days in Tullavrick. Then the meeting of my boyhood friends Jack Fahy, Mickey Molloy, Jim Faherty, Jim Matterson and Jim Joe Clancy and also later on visiting my cousin Bridie Molloy from Derrymoyle, and Mary Kelly, sister of Jim Faherty. Needless to say that trip in 1991 was a roller coaster of emotions and although I thought of writing down some thoughts at the time I decided to wait until now, four years later. Since 1991 my wife and I have revisited Oughterard in 1992 and again in 1994. I spent cherished hours with Uncle Tom, my boyhood companion, now and a man of nearly ninety. I remember how hard he worked in Tullavrick and Tonwee. And how he defended me in my only quarrel with the school when I refused to give the names of some students who raided a neighbour’s orchard. This incident changed my whole perspective on authority in general, even a so-called benevolent none. My Uncle Tom went to his final reward in December 1993. May God be good to him? Our family in Tullavrick were deeply religious as we followed the example of my saintly grandmother who did not take milk in her tea at Lent. It is from her I learnt the teachings of Christ, as she practiced what the clergy preached in church. Oh what an example! Her life remains the standard for my life all the years since. It is ironic that despite the great devotion that Irish society paid then to the Mother of God, the female gender ran a poor second to the male species. This I found incongruous, and still do, as I firmly believe that we are all created in the image and likeness of God. It was wonderful to talk with my boyhood chums and discuss some school day events as if they happened yesterday. I went to school each day with Jim Faherty and most days we were accompanied by Mick Molloy and an entourage from Baurisheen. Not all the Baurishee crowd made it to the school. Jim Joe Clancy used to stand next to me in school as our class stood as the other class was seated. I recall Jimmy Masterson on my trips to play handball in the ruins of the old barracks in Camp St.
Jack Fahy and I were friends from the day I started school. We had a common ambition in that we each loved to learn. I owe much to him for his desire for academic achievement. Jack has asked me to comment now and then on Oughterard. Maybe by now I can be somewhat objective. One has to remember I am talking about an altogether different era: running water was not universally enjoyed. There were probably less than six automobiles in Oughterard. The Boys School was a two-room affair in Tonwee. The schoolteacher was Gerard Lee, a good man, although he had some not so good assistants. One I remember by last name only, that of “Melvin” stands out as being particularly obnoxious. I do not recall any serious confrontations with him. I do know however I viewed him with some measured contempt. I had an unusual status in school and in the town as they called me ‘Boston Tom” a tribute to my American heritage. So I ran with everyone from the town and from outside. I was aware of the caste system wherein the townsfolk felt somewhat superior to the outside peasants, but I also recall that ranks of the men who stood up in 1916 did not overflow with shopkeepers! As you can tell, my rebel’s leanings are still strong. I still remember going with my uncle Bartley (a true rebel) to Clifden to see Eamonn de Valera, and hung on his every word. My Uncle Michael left Tullavrick for the States shortly after I got there. Mick had stood up and served in the fight. Which reminds me, I was not impressed with the memorial to those brave men of 1916 as I saw it at the Dublin Post Office in 1991. Is the Irish Government afraid of what the English might say? What kind of Government would there have been, were it not for those men, who gave their lives that succeeding generations might live? How soon we forget. My one regret (there is always something) is that our whole family could not have come with us, but my oldest son Tom, my daughter Mary and my son Kevin are all married and are busy with their respective families. Now and then comments are not so easy to do. Of course there are more cars in Oughterard. The population is much less parochial, as visitors have come to stay. It had a much more affluent veneer yet I’m not sure that the quality of life has improved that much. I have to continually to remind myself that I’m remembering through boyhood’s eyes and we do remember in a pleasant glow. The trip in 1919 opened up a new world of contacts for me; the Mc Gauleys in Tonwee, Pete Tierney in New Village, Bridie Molloy and Mary Kelly in Baurisheen, and of course my boyhood chums. When I think of Oughterard now the new Oughterard emerges but the image of the old town is still strong and will not fade while life remains, so I can say with many who have gone before me that there remains within me a deep abiding love of this little corner of Ireland and how thankful I am that I lived there and obtained there the foundation for a rewarding life. 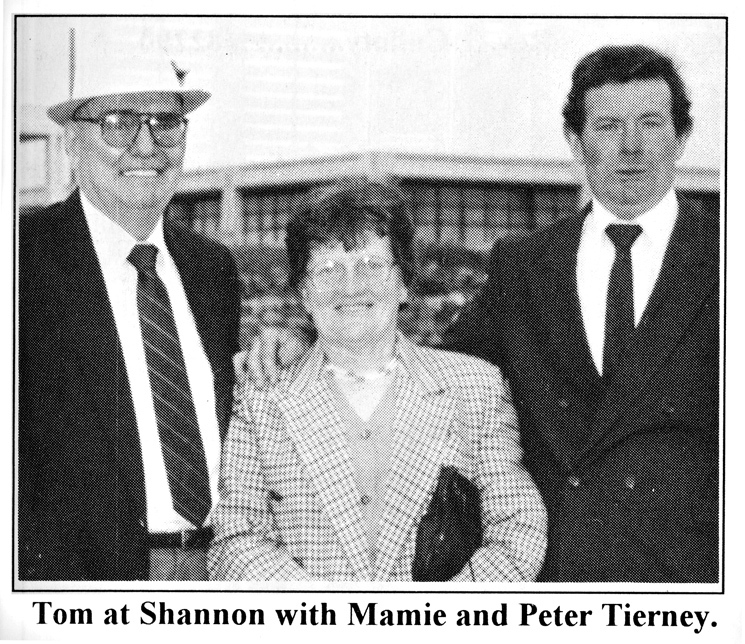 Note: This article was published in “The Oughterard Newsletter” April 1995.